For instructions on how to add a Certificate to your course, view Moodle 3: Activities & Resources: Add a Certificate. In the General settings, the instructor can designate a title and provide a description or prompt for the assignment. These settings specify if the instructor wants to receive a notification email when a student obtains a certificate, how the certificate will be displayed, and if a copy of each certificate be included in the course files. 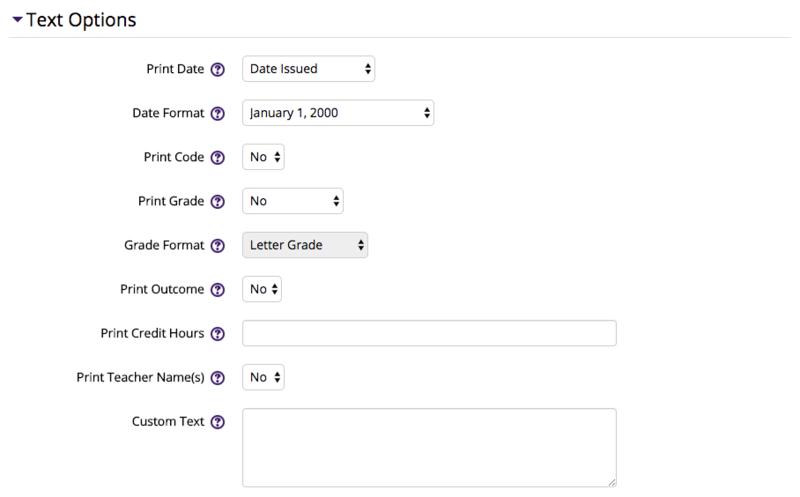 The Text options settings all instructors to format the certficate with a style of date, whether the certificate can be printed, if there are credit hours attached to the course, and how the instructor's name should be signed. Set formatting, such as page orientation and if a border image is desired. Keep in mind that images increase the file size of the certificate, so instructors may want to select a Border Line instead (see Design Options below). The Certificate Type refers to the font style of the certificate. Embedded fonts use Dejavusans and Dejavuserif fonts, while the non-embedded types use Helvetica and Times fonts. Border Lines can be set from 'None' or have a color. Instructors can elect to include a watermark, include an image of a signature, or use a seal or logo to be printed on the certificate. The signature image will be printed in the lower left, and the seal/logo in the lower right. These settings specify the visibility of the certificate for students (Hide/Show), and the group mode and grouping can be designated. The certificate can be restricted based upon a date, group, activity completion of another activity/resource in the course, etc. NOTE: If more than one restriction is added, students must meet EACH of the requirements before the assignment becomes available. By default, students can manually mark the certificate as complete, but an instructor can change this to be required. If required, students can be marked complete by viewing the certificate. Tags are keywords that can be added to an activity or resource.